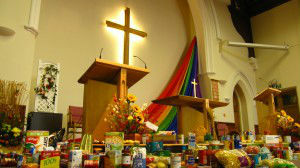 At the start of our new Church year we celebrate Harvest. Gifts of food and flowers are brought and arranged in the church. During the service we give thanks for God’s provision of all the elements needed to feed and, of course, to clothe ourselves. We sing and pray too that others will also enjoy the great benefits of God’s grace, here in Britain and particularly across the world where people are suffering and dying for want of food and shelter. We pray that our own country, and other nations sending gifts and physical help in international aid, will do everything possible to match their contribution to the need. After the services, the gifts brought to the church are distributed to those in need in the town and surrounding area. Non-perishable items are donated to the Whitechapel Mission, Bishop's Stortford Food Bank and the YMCA in Bishop’s Stortford.